On Friday, May 18, 2018, more than 50 seniors were honored during The Dean’s Awards luncheon held in the Jordan Hall of Science Galleria. Mary Galvin, William K. Warren Foundation Dean of the College of Science, introduced Andrew Grose as Valedictorian and Harisa Spahić as Salutatorian to the crowd of more than 200 students, families, and faculty members who gathered together to celebrate the students’ accomplishments. 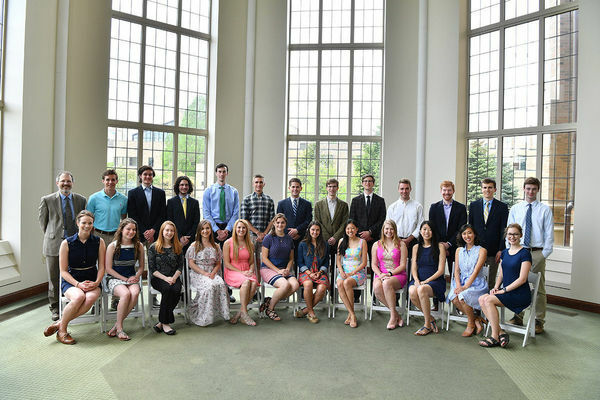 Each year the Dean’s Award is presented to an outstanding graduating senior in the College of Science in recognition of exemplary personal character, leadership, service and outstanding achievement. The 2018 recipient was Luke Maillie, a Physics-in-Medicine major with honors and an International Development Studies minor. His exceptional academic performance is only one of many achievements that highlight his career at Notre Dame. Maillie was awarded a Fulbright research grant to study systems of referral for rural cancer patients in Tanzania. Not only has he devoted 33 weeks of volunteer time at Shirati Hospital in Tanzania, he has also raised $27,000 for the cervical cancer ward and authored a $50,000 proposal to the Rotary Foundation for long-term funding. He is currently working with Pink Ribbon, Red Ribbon, whose mission is to ensure that all women have access to high-quality prevention, screening, and treatment for cervical and breast cancers. Maillie is the winner of a $20,000 D-Prize, which funds new entrepreneurs who solve distribution challenges for proven poverty interventions. He is also CEO and co-founder of LumenTech, LLC – a new venture working with dermatologists to develop and license wearable UV sensors to prevent skin cancer; the provisional patent was recently filed in March 2018. Maillie plans to spend a year exploring referral systems for rural cancer patients in Tanzania before attending the Icahn School of Medicine in New York. 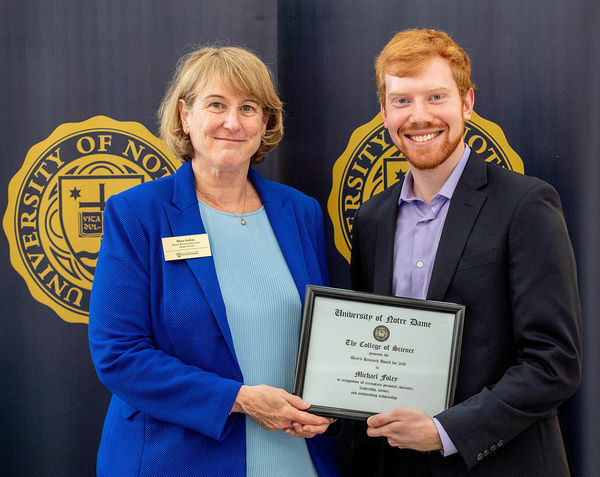 The Dean’s Research Award is presented annually to the outstanding graduating senior in the College of Science who has conducted exceptional research within and across the traditional boundaries of scholarly disciplines and who embraces, facilitates, and fosters an environment of scientific inquiry. 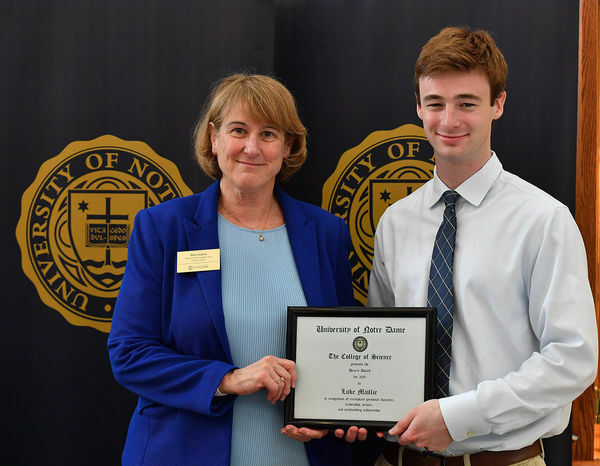 The 2018 recipient of the Dean’s Research Award was Michael Foley, a Mathematics and Physics with honors double major with a concentration in astrophysics. Foley has been the recipient of numerous awards including a 2017 Goldwater Scholarship and the Chambliss Astronomy Achievement Student Award. He was awarded a National Science Foundation Graduate Research Fellowship as well as a Gates Cambridge Scholarship, which he declined. In addition to his numerous awards, he has six publications, four of which were as first author. He has also delivered nine presentations at various symposiums and conferences. Foley plans to attend Harvard University to pursue a doctoral degree in astrophysics. In addition to the Dean’s Awards, each department within the College of Science presented awards to graduating seniors. Alan Huebner, Ph.D., director of undergraduate studies for Department of Applied and Computational Mathematics and Statistics (ACMS), presented the Outstanding ACMS Major Award to Joseph Pennacchio and Yuchen Zou. The General Electric Prize for Honors Mathematics Majors: Christian Hokaj, Patrick LeBlanc, and Paul Sweeney Jr.
Sr. Kathleen Cannon, OP, associate dean of the College of Science, presented the Science-Business Award to Eric Lee. To conclude the event, select faculty were honored for their contributions to teaching. Juan Migliore, Ph.D., professor in the Department of Mathematics, received the Father James L. Shilts, C.S.C./Doris and Gene Leonard Teaching Award. The Rev. Edmund P. Joyce, C.S.C. Award for Excellence in Undergraduate Teaching went to four professors: Patricia Clark, Ph.D., professor in the Department of Chemistry and Biochemistry; Paul Huber, Ph.D., professor in the Department of Chemistry and Biochemistry; Mark Olsen, associate professional specialist in the Department of Biological Sciences; and Kevin Vaughan, Ph.D., associate professor in the Department of Biological Sciences. Originally published by Tammi Freehling at science.nd.edu on May 22, 2018.